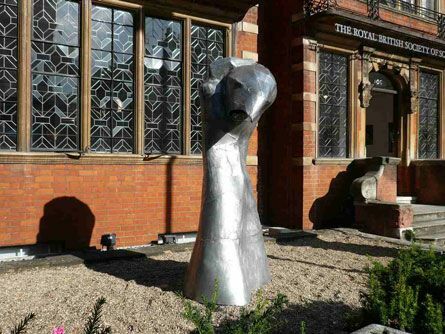 The Royal British Society of Sculptors (RBS) and Canary Wharf Group plc, both committed to promoting excellence and innovation in public art, launched the FIRST@108 Public Art Award to provide a unique opportunity for artists new to public art to develop the specific skills and experience required to compete for large-scale sculpture commissions. Worley impressed the jury with his innovative, powerful and memorable proposal for ?Avatar?. In keeping with the 2009 award theme ?Interaction? Worley proposed a sculpture which interacts between two opposing forces pulling in opposite directions. The avatar figure, portrayed as a hawk-like beast has a shrunken human form embedded on its back, a symbiosis which is both parasitic and complementary.